Tukijo is a farmer and activist from Kulon Progo, Jogjakarta, Indonesia. He was kidnapped by the state and jailed for 2 years and 6 months, after the bloom of resistence against the mega-mining project from Australian company backed up by the provincial goverment and police. Tukijo accused as kidnapper of two officers from the mining company and provocateur for disturbing social peace. He faced fake trials with fake witnesses in the court. He was active member of the local struggle and became one the leading figures in Kulon Progo at the time. While in prison, Tukijo received many solidarity actions. Some early direct actions from Indonesia was mentioned his name in solidarity. Included the action from Long Live Luciano Tortuga Cell – FAI Indonesia, where end up with arrests by police against comrades Billy and Eat. Tukijo spent his time in the prison with dignity and never step back from his struggle to defense his land and community from the mega-mining project. Later, while Tukijo still in the prison, some of his comrades who stay outside start to connecting all the local struggle points which is lead to the establishment of the farmer association named: Forum Komunikasi Masyarakat Agraris (Forum for Communication between Agrarian Communities). Statement of the Second Autonomous Peasant Farmer’s Congress, 10th February 2012 – Forum for Communication between Agrarian Communities – here. Thursday 8.3.2013 a group of people gathered in front of Finlandia Hall [in Helsinki, Finland] to demonstrate their discontentment against environmental crimes done by Finnish mining company Talvivaara* while the company was having shareholders meeting. At the same time we did a solidarity action at Talvivaara headquarters in Espoo. 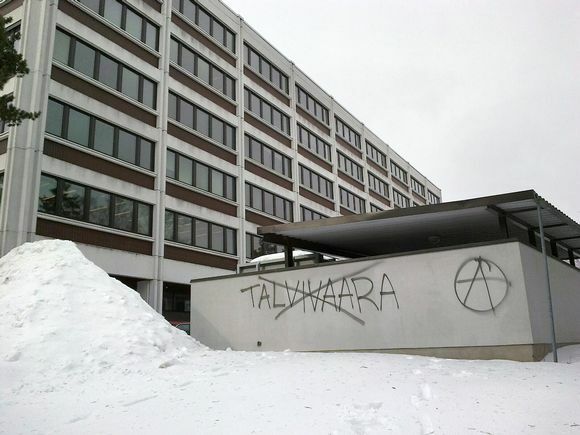 We throw smoke bombs inside the corridor of the building and decorated the wall with anti-Talvivaara slogan. Our action was in solidarity with all those who have been suffering of the operations of Talvivaara mine and those who are fighting against the company. Also we want to express our solidarity to smallholder rebellions in Kulon Progon area in Java Island [in Indonesia] and Tukijo that is imprisoned by Indonesian state. We are deeply sorry about extra heart beats we caused for the worker in the corridor. * Finnish mining company having a huge open-pit mine in North-East Finland. For years the local people and activists have brought up the fundamental violation of environmental legislation of Talvivaara. In December 2012 the company had major leak of poisonous waste water into lakes around the mining area causing of large scale pollution and it has still serious problems to “clean” the production line – probably never succeed. Talvivaara is mining mainly nickel and zinc, but uranium as well. There is no reason to step back. War continues as always and must be more violent each and every time. All of the infrastructures of the society are our targets and there are no excuses to let one still stand against the beautiful sky. All the buildings are the walls against our sight to see the stars, the same stars which our imprisoned and guerrilla comrades in other part of the world are also seeing. Through the fire, we want to send our warmest greetings to the knights warriors around the globe who still carry on attacks as our revolutionary way. To the brave and dignified prisoners who kept their head up against the misery and cowardice of ‘reformist’ anarchists. Last night (Friday, 22 February), we burned down another property of Society. We placed an incendiary of fire in the middle-class shopping areas in North Jakarta. We burn the shops as our sample and to once again call the individuals to create their own attacks –especially in Indonesia and South East Asia. We showed through practice that each individual can bring their anger into fire and gasoline without the specializations of elite units. We are not vanguards or the messiah to save the Society. We are the angry individuals who only want to burn down Society. Only cowards –even self-proclaimed as anarchists– who only see the fire is rising and covering the sky with dark smokes and doing nothing. Cowards are the integral parts of the Society who are always waiting for the ‘right moments’ and trying to keep their life in the comfort zones. And we point out the cowards as our enemies and we will hunt you down also. In the future, we will not feel sorry if in our actions to attack Society, we are risking the life of someone. From now, we will limit our revolutionary greetings to the comrades who in our judgements are revolutionary. We will not let our fire warm the ‘innocent’, ‘reformist’, ‘pacifist’, ‘formal and pro-judicial anarchists’, ‘facebook anarchists’ and other cowards. Our actions always are only for ourselves and our individualistic values and for the revolutionary comrades. And through the fire, we send our love to the imprisoned comrades: Conspiracy of Cells of Fire, the 4 anarchists who are recently accused for double robbery in Greece, Alfredo and Nicola and other comrades who accused in Operation Thor, Ixodae, Mangifuoco, and similar repressions in Italy, to Gabriel Pombo da Silva and to Marco Camenisch, to Marcelo, Juan, Fredy, Ivan & Carla in Chile, to Henry in Bolivia, to injured one Tripa Lopez in Mexico, to Tukijo and to the insurrectionary prisoners behind state bars who always kept their dignity and revolutionary values. We also want to send our love to the comrades on the run: Felicity, Hans and others. Keep running and do not let the enemies catch you. Love and revolutionary greetings to the individuals, cells and groups of Informal Anarchist Federation – International Revolutionary Front. Let’s surround Society with our fires. War continues until the collapse of the society. This video is a contribution to commemorate and honor the spirit of resistance against corporate and state- by Tukijo one of the brave farmers of Kulonprogo who is held hostage inside prison. This video is dedicated and prepared by our comrades as an active contribution and participation in the horizontal struggle of farmers in Kulonprogo. Perjuangan kami tidak dapat dibatasi dalam terma-terma peradaban. Kami tak dapat dimengerti. Kami liar dan merupakan musuh peradaban. Tidak hanya negara dan kapital, tapi seluruh peradaban: kami menentang seluruhnya. Kami adalah mereka yang dengan bangga menanggalkan kedamaian sosial, melangkah keluar dari zona-zona nyaman kami dan melakukan serangan terhadap apa yang kami benci. Kami mendeklarasikan perang terhadap peradaban dan seluruh propertinya dan bergabung dalam perang gerilya urban internasional bersama saudara-saudari seperjuangan kami di Federasi Informal Anarkis dan Front Revolusioner Internasional. Kami mengklaim dan mengambil tanggung jawab atas aksi pembakaran terhadap mobil dan rumah Wakil Sekretaris DPD Demokrat (partai pemenang pemilu 2009) di Sumatera Selatan, aksi pembakaran terhadap 4 mesin ATM di Makassar, dan serangan terhadap dua gardu listrik di Jakarta selama seminggu terakhir. Aksi-aksi kami dipersembahkan sebagai solidaritas terhadap perjuangan petani Ogan Kemilir Ilir, kepada pemberontak di Papua: Buktar Tabuni dan Dominikus Sorabut yang ditahan oleh pemerintah Indonesia, kepada seluruh perjuangan anti tambang yang tersebar dan mekar di sepanjang pesisir selatan Jawa, dan kepada masyarakat adat di Kalimantan, Mentawai, Jambi dan Papua. Kami juga mengirimkan salam revolusioner teruntuk Tukijo: petani pemberani dan terhormat dari Kulon Progo, teruntuk tahanan-tahanan kasus NO TAV, tahanan-tahanan ELF di Amerika Serikat, teruntuk Marco Camenisch dan Gabriel Pombo da Silva, juga teruntuk para tahanan anarkis yang tidak pernah mundur dan tunduk di bawah hukum. Juga kepada organisasi-organisasi revolusioner: Konspirasi Sel-sel Api (KSA) dan Perjuangan Revolusioner (PR) di Yunani, seluruh seksi dan fraksi dari Front Pembebasan Bumi (FPB) dan Front Pembebasan Hewan (FPH) di seluruh dunia, Individu-individu Yang Liar (IYL) di Meksiko, dan seluruh sel Federasi Informal Anarkis/Front Revolusioner Internasional (FIA/FRI). Kepada para kamerad Konspirasi Internasional untuk Balas Dendam: mari bakar habis kemeleratan dan perbudakan! Hingga pada kebebasan utuh dan kehidupan liar! Our struggle can’t be limited under civilization terms. We out of it. We are wild and we are enemies of civilization. Not only the state and capital (in old terms of anarchism), but all the civilization: we are against it. We are the ones who proudly throw out the social peace, walk out from our comfort zones and carried an attack actions against what we hate. We are declaring war against civilization and it’s property and join in the international urban guerrilla warfare with all our brothers and sisters in Informal Anarchist Federation and International Revolutionary Front. We claim and take responsibility for arsons against car and shop belonging to the Vice Secretary of Demokrat in South Sumatera (winning party of 2009 general election), arsons against 4 ATMs in Makassar, and actions against two electrical substations during last week in Jakarta. Our actions are dedicated to the farmers struggle in Ogan Kemilir Ilir, to the rebels in Papua: Buktar Tabuni and Dominikus Sorabut who are imprisoned by the Indonesian State, to the struggles against mining which spread and blossomed in south coast of Java, and to the natives in Kalimantan, Mentawai, Jambi and Papua. We also want to send our revolutionary greetings to Tukijo: brave and dignified farmer from Kulon Progo, to the NO TAV prisoners in Italia, to the ELF prisoners in USA, to Marco Camenisch and Gabriel Pombo da Silva and to all anarchist prisoners who never step down and bow under the law. Also to revolutionary organizations: Conspiracy of Cells of Fire (CCF) and Epasnatatikos Agonas (EA) in Greece, all the sections and fractions of Earth Liberation Front (ELF) and Animal Liberation Front (ALF) around the world, to Individualidades Tendiendo a lo Salvaje (ITS) in Mexico and to all cells of Informal Anarchist Federation/International Revolutionary Front (FAI/IRF). To our comrades of International Conspiracy for Revenge: let’s burn down this misery and slavery! Till the collapse of this civilization! Till to the total freedom and wild life! It’s always a reason to say that the lack of numbers is the main reason. But for us the only obstacle is fear. Theories, reasons and situations are the walls of the labyrinth which always became a reason for obstruction and restriction. As well as the accusations that the kidnapping of two members, of our comrades Billy and Eat, is a barrier to the ongoing actions for destruction. On August 23, at a power plant in Kotamobagu, North Sulawesi, we put an incendiary device that failed to ignite. We were disappointed with ourselves and the ability of each individual who was involved in the attack. But on the other hand, we learned that no one should regret. Tonight August 31, we re-commit to do the same “crimes”. Leaving the device in order to burn an electrical substation in Tuminting, Manado. The goal is clear. We are angry. Really angry! This action is also as a response and as an answer to the unlimited solidarity from many rebellion comrades and companer@s.
To the uncontrolled and brave comrades in the darkness of Bolivia, Chile, Mexico, Greece, Argentina, and England as well as to other places that were never mentioned. To Olga and all the comrades from Conspiracy of Cells of Fire and Tasos Theofilou who was recently arrested because he was an anarchist. Also we do not forget to mention Theofilos Mavropoulos, Gabriel Pombo da Silva, Rami Syrianos, and Marco Camenisch who are undergoing a hunger strike. All of you are rebels who inspired us despite the fact that you are seized behind bars. To Luciano Tortuga and Mario Lopez, also never forget to mention Ivan Silva and Carla Verdugo in Chile. Henry Zegarrundo, Juan Aliste Vega, Freddy Fuentevilla Saa, Marcelo Villarroel Sepúlveda also are an inspiration. Do not forget to dissidents like Felicity Ryder, Nikos Maziotis and Pola Roupa also lastly to K. The fugitive member of the Long Live Luciano Tortuga Cell, Informal Anarchist Federation / International Revolutionary Front (FAI / FRI). But with fully of shame in our face we mention our two brothers in struggle, members of Long Live Luciano Tortuga Cell, Informal Anarchist Federation / International Revolutionary Front; Billy Augustan and Reyhard Rumbayan (Eat). Also do not forget the brave one of Kulonprogo; Tukijo. For those we send our greetings with the lights of fire from the street. To them we are sending our love. These actions are also as a manifestation of anger and disappointment. Impatience for those rebels who after attacks returned to run and hide and spent long time to keep waiting, including us. Comrades, it is time to strike back. Do not wait. Time to light it up! On Thursday, April 26, 2012, the four comrades who were captured in Malang underwent further interrogation by the police-pigs. The interrogation itself lasted for 8 hours from 10 am to 6 pm. Two comrades immediately undergo interrogation in two separate rooms. Interrogation lasted for 5 and 6 hours. While two other comrades were told to wait. The matters focused on in the interrogations, range from questions about the chronology of the vandalism action until the comrades were finally caught by the pigs, to the pigs demanding to know who had proposed the idea of the action as well, and about the relationship between the vandals and the comrades of Katalis and Kontinum. Questions about the association with the two anti-authoritarian groups (Katalis + Kontinum) were because in the bag of one comrade was found pamphlets of the two groups. One comrade who also got the same questions plus another question about who had the idea of making posters of solidarity for the four combatants in jail (Billy & Eat, Tukijo and Hidayat), and how the association between the four comrades and the imprisoned combatants are, how the comrades know about the condition of the combatants and why the acts of vandalism solidarity should be dedicated to the 4 people who are combatants. The interrogation ended with the four comrades in Malang having to register their identity cards, and the interrogation continues on Monday, April 30, 2012. Some items still have not been returned because they was seized by the police-pigs (USB, solidarity posters, paint-bombs, the diary of one comrade, comrades identity card and spray-paint). Three of the comrades are demanded to sign a witness form and one other comrade still has to undergo further interrogation before being forced to sign the forms. The pig-cop trying to entrap the four comrades by letting the case drag on, is based on the grounds of waiting for complaints from owners of buildings whom such acts of vandalism (spray-paint slogans, posters, paintbombs) were directed. If there is a lawsuit from the owners of the building, then the 4 comrades in Malang will undergo further interrogation and will face legal proceedings. Solidarity to 4 Malang combatants! Long live the live action! On the night of Friday, April 20, 2012, four people were arrested by police [in Malang] when comrades are doing acts of vandalism as a form of solidarity against a variety of asymmetric struggle against the state, capital and society and solidarity to the imprisoned revolutionary combatants (Billy & Eat, Tukijo and Hidayat). The four comrades were detained and underwent a long interrogation for 17 hours without stopping before then released while still in the surveillance and investigation of the police. New booklet just released from Act for Freedom / Elephant Editions, all about the struggle in Indonesia against the mega-project threatening the coastal farming communities of Kulon Progo, featuring action reports, communiques, international solidarity and more. The booklet is designed in a format to be printed out and reproduced. Please distribute. This important call-out for revolutionary solidarity with the struggle in Indonesia has been translated into several languages which can be found on the website Contra-Info, in Greek, Spanish, Italian, French, German and Portuguese. October 7, 2011. At 2 am, Bank Rakyat Indonesia (BRI) ATM Bank in Sleman, Yogyakarta, is set on fire. The fire causes an explosion in the unit which destroys the premises. The sabotage is just one more instance of resistance in a country which is destroying it’s trees, mountains and coastlines for profit whilst oppressing its people. Now 3 people are arrested [2 remain -Eat & Billy-, the third was released]. They are all accused of being involved in damaging the bank. We are not interested in finding out if the prisoners are “guilty” or not, nor of the extent of their “crime”. We will leave such speculation to the inquisitors and their servants in the press. We don’t need to know the details of the entire situation to know that as long as the state and the banks get rich from exploitation, there will always be those who will go against their power and refuse to collaborate. It is enough that these people are imprisoned, to wish that not just their prison, but every prison ceases to exist. “Crime” is no food on the table and the bosses taking the lion’s share. “Crime” is clear-cut forests and mining companies who beat and kill who they like with the help of the police. Freedom is fighting back and reclaiming your life from oppression. What we know is that Indonesia is a regime which is propped up by western capitalists and militarists. It is a nation which tortures and massacres its opposition, like every state that can get away with it where it can. Kulon Progo is a farming area near Yogyakarta, and in 2005 Jogja Magasa Mining and Indomines metal industries wanted to take the land for their industry. The farmers there didn’t give their land to the industrial company because they didn’t want nature to be destroyed by them. Many times the farmers tried to solve this without any riots, but it’s not working. Now they are ready to defend their lives. It started when the company paid 300 people to destroy the houses of farmers and all the plants there. It made all the farmers get angry and also lots of other people besides. Human dignity and nature just colonized by money, and there will never be any help to let the farmers survive. The police just covered up the people who were attacking the farmers because the company paid off the police. A typical story. Tukijo was a farmer who was arrested and imprisoned just because he was vocal in the demonstrations against this situation. The people in Indonesia have made many activities around this matter : demonstrations, articles, movies, graffiti and property damage against the profiteering companies. The farmers and the people of Kulon Progo, Pandang Raya, West Papua, Bima and elsewhere, are appealing for international solidarity and complicity in their struggle alongside the anarchists and anti-capitalists, who are all against the violent terror of the Indonesian bosses, their paid murderers and corporate backers. Don’t let them fight alone! In accordance with the wishes of the farmers, we demand the land is given back to the farmers and freedom for our friends who are in prison because of this. The State-Corporations-Military-Police are the Terrorists! Freedom for Tukijo and those accused of attacking the BRI ATM Bank! A few anarchists in solidarity. 2 comrades, Eat and Billy are imprisoned having taken responsibility for this action. There has been a call-out for revolutionary solidarity with the struggle in Indonesia – translated into several languages, which can be found on the website Contra-Info, in Greek, Spanish, Italian, French, German and Portuguese. More details to follow. Kali ini kami mengatakan, bahwa apa yang kami lakukan merupakan puncak dari semua kegelisahan serta kemarahan kami terhadap sistem yang sedang berjalan ini. Sistem yang memberhalakan uang, sistem yang merecoki keseharian masyarakat dengan televisi, agar mereka membeli barang-barang yang tak mereka perlukan agar mereka terus bekerja seperti mesin. Sistem yang mengharuskan kami beserta masyarakat lainnya tidak memiliki kendali atas hidup kita sendiri. Sistem yang lainnya menguntungkan borjuis, para pebisnis, dan para birokrat negara yang menjadi sekutu setianya. Bagi kami semua, ini bukan saatnya untuk diam, bukan saatnya untuk tenang menonton acara di depan televisi dan berkata bahwa “semua baik-baik saja”. Untuk setiap penindasan di Papua Barat. Untuk setiap penindasan di Kulon Progo. Untuk setiap penindasan bersejarah di Aceh. Untuk setiap penindasan di Wera, Bima. Untuk setiap penggusuran dan perampasan lahan di Takalar dan Pandan Raya di Makasar. Untuk setiap penindasan terhadap kawan-kawan kami yang berjuang. Untuk Tukijo dan para kombatan sosial yang mendekam di penjara hanya karena berjuang mempertahankan hak hidupnya. Untuk setiap konsensi hutan yang akan menghancurkan setiap keanekaragaman hayati mengatasnamakan uang dan bisnis! Dan untuk setiap penjara yang seharusnya terbakar rata dengan tanah. Maka selama negara dan kapitalisme masih eksis, tak pernah akan ada kata damai antara mereka yang tak berpunya dengan mereka yang berpunya. Penyerangan terhadap pusat-pusat finansial: ATM, bank, gedung korporat adalah target yang penting, karena mereka adalah salah satu kolaborator yang menyebabkan penderitaan di muka bumi ini. Ini bukanlah terorisme karena kami tidak mengadvokasikan untuk menyerang orang-orang, terorisme adalah peperangan antar negara. Terorisme adalah beras dan pangan di dapurmu yang semakin menipis. Terorisme adalah bajingan berseragam yang membawa senjata ke mana-mana. Terorisme adalah pembantaian orang-orang tak berpunya. Maka kami mengatakan: sudah cukup! Dan ini juga untuk kalian! Para kombatan yang tak pernah surut untuk berjuang di luar sana, meski kalian harus mendekam di jeruji besi karena keyakinan kalian akan kebebasan: Conspiracy of Cells of Fire (Yunani), kombatan Chile: Tortuga! Lives on! Gabriel Pombo da Silva, Thomas Meyer Falk (Germany) Polykarpos Georgiades, Revolutionary Struggle! Salut bagi kombatan Manado, Makassar, dan Bandung, kalian adalah inspirasi di tengah ketidakberdayaan masyarakat akan hidup mereka yang semakin tidak menentu dan tak berdaya. This time we say, that what we are doing is the culmination of all our anxieties and anger against a system that is running this. Systems that idolize money, a system that nags the public daily with television, so they buy things they do not need so that they continue to work like a machine. System that required us and other people to not have control over our own lives. Another system that benefits the bourgeoisie, the businessmen, and state bureaucrats who become loyal allies. For us all, this is not the time to be quiet, not the time to calmly watch the event in front of the television and say that “all is okay”. For each incident of repression in West Papua. For each incident of oppression in Kulon Progo. For every historic repression in Aceh. For each incident of oppression in Wera, Bima. For any evictions and land seizures in Takalar and Pandan Raya in Makassar. For each of the oppression of our comrades who are struggling. To Tukijo and social combatants languishing in jail just because of fighting for their life right. For each forest concession that would destroy any biodiversity on behalf of money and business! And for every prison should have burned to the ground. So long as the state and capitalism still exist, never will there be words of peace between those dispossessed by those who are propertied. Attacks on financial centers: ATMs, banks, corporate buildings is an important target, because they are one of the collaborators who cause suffering on this earth. This is not because we do not advocate terrorism to attack the people, terrorism is a war between countries. Terrorism is rice and food in your kitchen that are running low. Terrorism is a crook in uniform who carries weapons everywhere. Terrorism is the massacre of the dispossessed. Tortuga! The combatants who never stopped to fight out there, although you have to crouch on the bars but you have freedom of thought: Conspiracy of Cells of Fire (Greece), combatants in Chile: Tortuga! Lives on! Gabriel Pombo da Silva, Thomas Meyer Falk (Germany) Polykarpos Georgiades, Revolutionary Struggle! Kudos for the combatants in Manado, Makassar, and Bandung, you are an inspiration in the middle of the powerlessness of their lives that society makes increasingly uncertain and helpless. PT JMI’s iron ore mining plans claim a victim again: Tukidjo.